Billions are spent airing to empty rooms. It's time to take action. TV is changing, stay in the know. Data and insights to keep you ahead of the game. Did you know that 29% of TV ads are not viewable? If an ad airs to an empty room, can it make an impact? This year, TV advertisers will spend billions on ads that run while no one is there to see them. That’s the finding of a new report from IPG Media Lab, based on TVision’s viewing behavior data. IPG Media Lab’s study found that nearly 29% of TV ads are not viewable. Perhaps the viewers got up to grab a snack, left the TV on, or were in another room. We’ve all been there. With eMarketer estimating that brands will spend $69 billion on TV in 2019, this constitutes a lot of potential advertising waste. As a former brand marketer, I was always held accountable to media ROI, and ultimately business results. TV advertisers today don’t need to be told it’s bad practice to spend a third of your budget on non-viewable ads. But historically, marketers have not been able to measure this, as John Wanamaker has oft been quoted. But, 100 years later, that’s not really the case anymore, is it? By getting serious about TV viewability, brands can get to the bottom of which ads are airing to empty rooms and which impressions are more likely to actually reach people. After all, you can’t reduce waste if you don’t know where it’s coming from. Different audiences deliver different levels of viewability. Today, 95% of TV advertising is bought on age and gender breakouts. Instead of paying to reach 1 million viewers, brands pay to advertise to 1 million women between the ages of 18-35. The rest of the people they happen to reach are baked into the cost of the ad buy. Crazy, right? Given the nature of the current model, it’s easy for TV advertisers to conclude that they’re already wasting plenty of money on all the viewers they contact outside their target demographic. But even then, there’s guaranteed to be plenty of waste in the audience group they’re paying for. 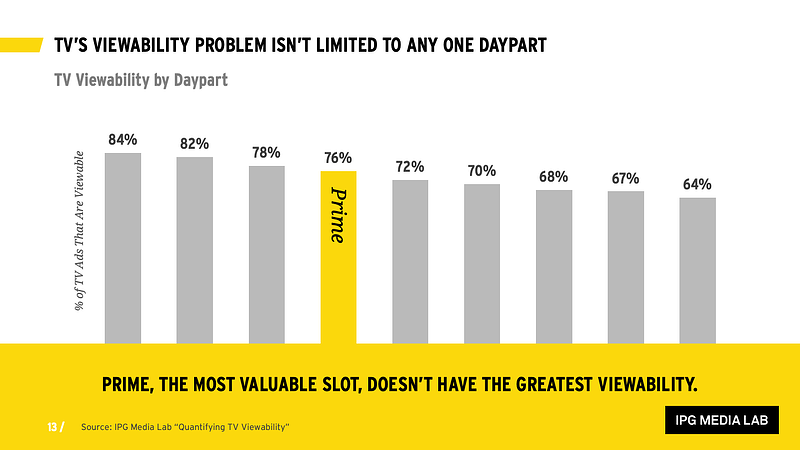 In their report, IPG Media Lab found that TV Viewability varied by many factors. For example, a significant percentage of ad spend across all dayparts went to non-viewable ads, served to audiences who weren’t in the room see them. As seen above, different TV environments provide different levels of viewability. In addition to varying by dayparts, viewability varies sharply across many different factors like ad length, pod position, audience targets, and yes, even specific brands. Viewability differs for every brand based on the composition of their media plan. If brand advertisers want to stop wasting money, they need to start shifting budgets to content and environments where viewers stick around. TV Viewability is here -- it’s up to marketers to take action. In recent years, TV measurement technology has taken several major leaps forward. Whereas previous generations of TV advertisers operated mostly in the dark, today’s savvy marketers can now get second-by-second TV performance metrics that tell them exactly where, when, and how their target audience was able to see the ad. It’s like the early days of digital marketing, but now for largest media investment. In an increasingly competitive, increasingly data-centric marketplace, the most successful brands are the ones that will go the extra mile to seek the data that lets them invest their dollars most efficiently. The most successful TV media sellers - across Linear and OTT - will act and trade off the same data. Sure, some players will do what they’ve always done, comfortable with the idea that wasted spend is a cost of doing business. But for every brand advertiser that ignores TV Viewability, there’s a competitor that’s ready to maximize its return on investment. For media marketers, the question is simple: Which side will you find yourself on? TV marketers will commit around 75% of their national TV spend during the Upfront. Unfortunately, many of the ads will never have a chance to be seen. TVision today announced its new TV Performance Metrics Platform - making campaign and ad-level metrics available for brand marketers. TVision today announced its commitment to the ARF's Member Code of Conduct. TVision uses cutting-edge technology to measure what was once unmeasurable - how people actually watch TV. The company’s panel is 100% opt-in and TVision is committed to the highest levels of ethics and principles. Insights about how performance metrics can help your business delivered straight to your inbox. Sign up for updates. The TV landscape is changing quickly - let us help you keep in the know without cluttering your inbox.